The Villages At Buffalo Run - Near by Buffalo Run Golf Course and a new park! MLS#3927018. Elevate Property Group LLC. Reunion - We invite you to tour this home today! MLS#2520278. Valor Real Estate, LLC. Close to DIA and E470. Quick close! MLS#9297526. RE/MAX Alliance. The Villages At Buffalo Run - Do not miss this well cared for home. MLS#7692494. The Carlton Company. Amazing backyard perfect for entertaining friends and family. A MUST SEE MLS#4279761. Equity Colorado. Don’t wait – this community will sell out quickly! MLS#8737225. RE/MAX Masters Millennium. Reunion - Garden fresh to table meals, you'll definitely be the neighborhood star with this home. Check out your future home! MLS#4869599. Keller Williams Preferred Realty. River Run - Showings start Friday, April 19th * NICE HOME * Corner Lot * Gorgeous Yard * 3 Car Tandem Garage * Extended Patio * Front Covered Porch * 5 bedrooms * 4 bathrooms * Tons of Space * New Exterior Paint * New Full Slab Granite Counters * Fresh Interior Paint * Finished Basement * Well maintained yard with sprinkler system * New Roof * New carpet being installed week of April 22, 2019 * 1/2 a block to park with playground * Great Curb Appeal * Owners may need short rent back waiting for new home completion * Show and Sell MLS#4521868. HOMES ACROSS COLORADO. Call for a private showing 720-590-0042 MLS#8216878. Keller Williams Preferred Realty. Ask about incentives for this or other stunning homes in Buffalo Highlands! Welcome home! MLS#8585449. RE/MAX Masters Millennium. This is a beautiful growing community! ! MLS#2244933. HomeSmart Cherry Creek. Foxton Village - Rare main floor master bedroom with 2 large bedrooms, full bath and sun-drenched loft on the 2nd floor. MLS#4228054. Berkshire Hathaway HomeServices Innovative RE. This home is sure to impress. MLS#9692857. LIV Sotheby's International Realty. River Run - Open House Sat April 20th 11am-1pm. MLS#3443156. KELLER WILLIAMS AVENUES REALTY. Raised beds are ready for your summer garden! https://my.matterport.com/show/?m=3JAZy2PqKsL MLS#5201090. Realty One Group Premier. The Villages At Buffalo Run - Fantastic location, just 3 blocks from Prestigious Run Buffalo Run Golf Course. NICE! ! MLS#3478007. Redfin Corporation. Buffalo Mesa - Home comes with a 30-day buyback guarantee. Terms and conditions apply. MLS#6644863. Opendoor Brokerage LLC. River Oaks - Don'T Forget About The Large Garage Area! Come Quick! MLS#2198137. Great Way RE Exclusive Properties. 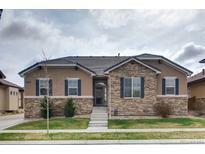 Quick access to DIA and walking paths to Rocky Mountain Arsenal Open Space MLS#5475328. Equity Colorado. Seller offering a $2500 credit for home improvemts. MLS#2941480. Your Castle Real Estate Inc.
Belle Creek - Pristine condition and priced to sell!! ! MLS#9376962. eXp Realty, LLC. The Villages At Buffalo Run - Close to the trails for nice walks. MLS#2930281. HomeSmart Cherry Creek.